Hungry for finger lickin’ chicken? Order mouthwatering chicken, nuggets, chips and burgers from a KFC restaurant near you. Get KFC delivery. No Minimum Spend. Get KFC delivered to your door! Famous all over the world for its 11 Herbs and Spices, KFC is the Finger Lickin’ Chicken that has created global phenomena. KFC has over 20,000 restaurants around the world, and its buckets of fried chicken can be found in 123 countries. The iconic Colonel Harland Sanders has become one of the most recognisable ‘fast-food’ figures, and his Original Recipe he invented in 1940 has become legendary. 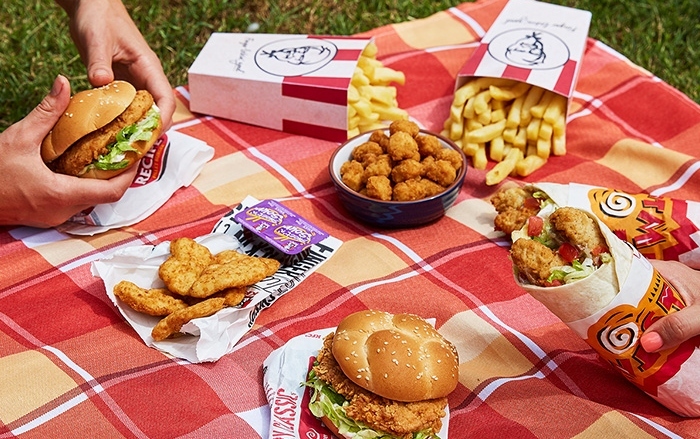 Since the first KFC store opened in 1968 in Guildford, Sydney, Australia, Aussies have become obsessed with the chicken, salads, burgers, nuggets, wraps and, of course the chips! There’s something so utterly satisfying in taking a bite into a KFC drumstick and experiencing that first mouthful of crunchy yet juicy chicken. And who can resist dunking a perfectly fried hot chip into a tub of potato and gravy? Or how about Nuggets dipped in sweet and sour sauce? And talking about mouth-watering morsels, Popcorn Chicken are perfect bite-sized pieces of deliciousness. They’re the ultimate finger food. Want KFC but can’t get to a restaurant? The solution to solving your hunger pangs is Menulog! Get buckets of chicken, burgers, mountains of the yummiest chips and all the sides delivered straight to your door. Imagine being able to feed a hoard of hungry people easily through Menulog in a few minutes, taking away the stress of cooking, with the added bonus of enjoying your favourite KFC meals.